Holy Cow!!! He dosen't even look the same. He totally looks like a big kid now! How crazy - Sooo handsome! I love it!!! He is a doll! You have the cutest kids. Scott thinks he looks just like Kory. Hello Handsome! You look so big I love it!!! I'm so glad you found my blog. It was great hearing from you. I'll be visiting this summer. Let's for sure get together. Life got crazy w/ the move and all. I'd love to fill you in on everything. Great experience. Love the results. Your family is adorable. Can I add you to my friend's link? WOW! he looks totally different from the picture you have on the side! I bet you have to take a double-take everytime you see him! I have to say he looks pretty dang handsome! 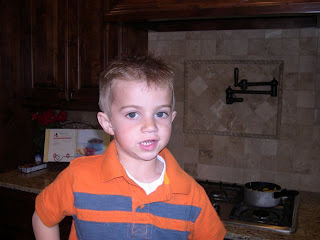 What a little stud! Did you guys have so much fun this weekend? I love it!!! He looks like so old now!! So cute!! 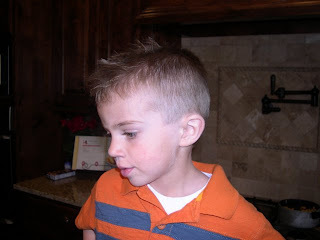 I would love the day I could give my kids haircuts, considering they both have hardly any hair! So cute!!! I can't believe how much older he looks! I love his hair! It's cute when you say something about his hair he always touches it! He looks older!! He is soo cute, regardless of his hair!! !